Results of the Stamp Design Competition on the theme “Women Empowerment”. Gurmeet Singh, 153(F)Near Bagga School，Village: Kasal，P.O. Naya Gaon, Dist. : S.A.S. Nagar. Athul S Raj , Maradom，Thundiparambil，Thirunakkara (PO)， Kottayam， Kerala. Pratheek Roopjith, Souparnika, Thazhe Vayalil， Dharmadam (P.O. )， Thalassery, Kannaur (Dist. )， Kerala. Special Cover on Dr. Jack De Sequeira, first opposition leader of Goa, Daman and Diu Legislative Assembly – 30th May 2015. Joao Hugo Eduardo de Sequeira (b. 20 April 1915 – d. 17 October 1989), popularly known as Dr. Jack de Sequeira; also known as Jak Siker according to local naming conventions, was a prominent Goan politician and is popularly known in Goa as the Father of the Opinion Poll. Dr. Sequeira born in Burma – now Myanmar, was the founder president of the United Goans Party established after the Liberation of Goa from the Portuguese colonial regime. He played a pivotal role in both, the assembly of the then Union Territory of Goa, Daman and Diu as the leader of the opposition, and in convincing the government of India to hold an Opinion Poll for deciding the issue of the merger of Goa into the state of Maharashtra. 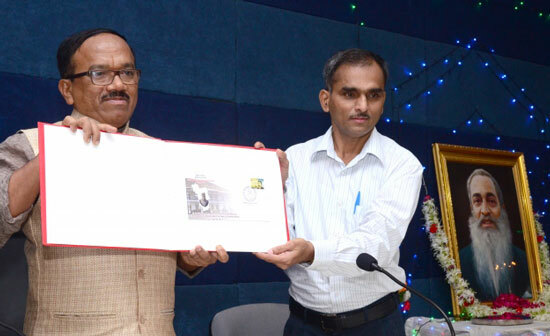 Chief Minister of Goa Laxmikant Parsekar and Postmaster General of Goa Region Shri Charles Lobo released a special cover on Dr. Jack De Sequeira, first opposition leader of Goa, Daman and Diu Legislative Assembly on 30th May, 2015 at Seminar Hall, Goa Legislative Assembly Complex in Porvorim (Special Cover approval no. MH/21/2015). Release of the cover was timed with Goa Statehood Day, which falls on 30th May. Chief Secretary R K Shrivastava, Environment Minister Alina Saldanha, MLAs Michael Lobo and Vijai Sardesai, family members of Dr Jack de Sequeira and other diginitaries were present on the occasion. The Cover depicts Dr. Jack De Sequeira's bust with a back ground of the map of Goa State and the old legislative assembly and secretariat of Goa, also known as the Adil Shah's Palace- which is located in Panaji along the banks of River Mandovi. This Palace housed the Legislature of Goa, Daman and Diu from January, 1964 till 1987. Even after Goa achieved Statehood in 1987, this Adil Shah's Palace housed the Goa State Legislative Assembly till the year 2000. 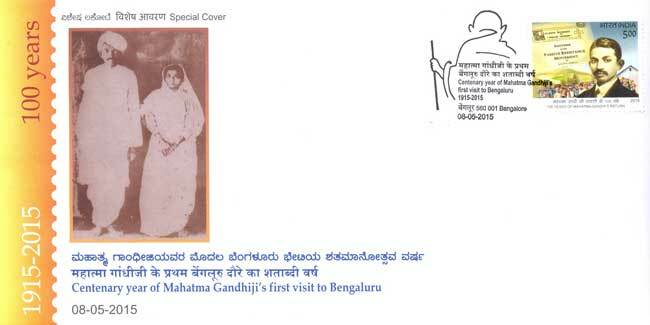 Special Cover on 81 Years of Mahatma Gandhiji’s Visit to Kodagu – 29th May 2015. Gandhiji arrived in Kodagu through Ponnampet on 22nd February 1934 as part of his campaign to mobilize support for the freedom movement. He was escorted by freedom fighter Shri Gundugutti Manjunathayya from Ponnampet to Swarnalaya at Suntikoppa on 23rd February 1934. Gandhiji addressed a gathering of the villagers at Gundugutti from the balcony of Swarnalaya which was the residence of Shri G M Manjunathayya. Gandhiji rested here for the night and proceeded to Madikeri next morning. 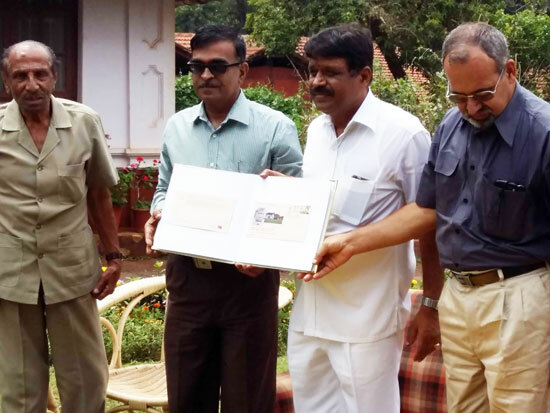 A special cover was released to commemorate 81 years of Mahatma Gandhiji’s first visit to Kodagu at Swarnalay, Suntikoppa by Sri Appacchu Ranjan, MLA Somwarpet Taluk, Kodagu district in presence of Lt Col. Kumar (Retd), Sri KV Anantharamu, SPOs Kodagu Dn, Sri AB Kantharaja, Inspector Post Somwarpet Sub Dn, Sri Sreenivas, Postmaster, Suntikoppa, other staff members of department of posts and Gundugutti family on 29th May 2015 at Suntikoppa – 571237 (Special Cover approval no. KTK/44/2015). Special cover features the photographs of Gandhiji addressing the villagers from the historical balcony of Swarnalaya and the Gundugutti Family mansion and lawns. The special cancellation is a graphic line sketch of Gandhiji seated in his typical pose while addressing a gathering or conducting prayer meetings. The cover was sponsored by the Gundugutti Family. Special Cover on 450 years of Holy Spirit Church, Margao – 24th May 2015. The Church of the Holy Spirit was first constructed in 1564 at the initiative of the then Provincial of the Jesuits, Fr. Antonio Quadros, the choice of the site having been made by the first Archbishop of Goa, D. Gaspar Leao Pereira (1560-67). The first mass was celebrated on Saturday in Albis (i.e. on 11th April, the Saturday before the second Sunday of Easter) of 1565. This church was destroyed by fire during the invasion by the Muslims in 1571. The second, built at the same spot and of the same material was destroyed in 1579, eight years later. The third edition had a very short duration. The fourth church building was built a little further away from the first, in 1589 and consecrated in 1595; it was extended in 1604. This whole edifice was demolished in 1645 and 30 years later in 1675, the present church building, the fifth one, was built. Its frontispiece is majestic and artistic and at its center one can see, high and above, the Holy Spirit and below it the Cenacle. Church of the Holy Spirit is one of the finest examples of Indian Baroque architecture. The sale of the cover was immediately withdrawn citing that the words "Holy Spirit Church” have not clearly appeared on the cancellation. While it was a major disappointment to all Philatelists, only a few could avail the covers before they were withdrawn. The sale of the said Special Covers will be started in another 2 to 4 days at the Margao and Panaji Head Post Offices, the authorities said. Special cover on Celebrations of Srimad Andavan Arts and Science College – 21st May 2015. Srimad Andavan Arts and Science College, Thiruvanaikoil is the brainchild of His Holiness Srirangam Srimad Andavan Swamigal. It was established in October 1996. The college is managed efficiently by Sri Ranganatha Paduka Vidyala Trust, includes a group of eminent educationalists and industrialists. It constantly endeavors to empower the youth to emerge as leaders of the future by offering quality, value based education and it attracts a beeline of students by its innovative programmes, teaching and learning strategies. Founder of college Srimad Andavan Swamigal was born in Srimushnam, a swayam vyaktha kshethra, in south Arcot district, on a Vaikasi – Arudra day in Yuva varusham 03rd June 1935 to U. Ve. Srinivasachariar and Sri Kumudhavalli. His great great grandfather Sri Nadu nattu Narayanachar was the prime disciple of Annarya Maha Desikan. The pooravasrama name of Srimushnam Andavan was Varahan. His father was a disciple of Sangeetha kalanidhi late Tiger Varadhachar swamy. Young Varahan used to sit by the side of his father during those music lessons and assimilated the nuances of Carnatic music to an astonishing degree which enabled Him to sing ragas with mellifluous voice. The 81st Tirunakshatram celebrations and Sathabhisheka mahothsavam of Srimad Srimushnam Andavan was held from 17th to 21st May 2015 at Srirangam Srimad Andavan Arts & Science College Campus, Srirangam / Thiruvanaikovil, Tiruchirappalli. A special cover to mark celebrations of Srimad Andavan Arts and Science College and my stamp to mark the ‘Sathabishekam’ (completion of 80 years) of Srimad Srimushnam Andavan were released on 21st May 2015. Shri J. T. Venkateswarlu, Postmaster General, Central Region, Tamil Nadu, released the special cover in presence of Srimad Srimushnam Andavan, Shri N. Ravi, Director, Kasturi & Sons Limited, publishers of The Hindu, Shri Venu Srinivasan, Chairman and Managing Director, TVS Motor Company and Sri Gopalaswamy, Ex. Chief Election Commissioner. 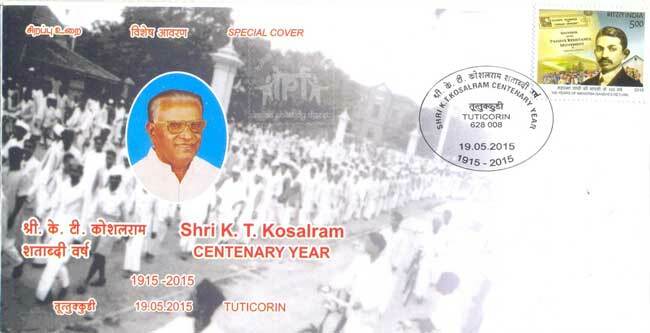 Special Cover on Shri K. T. Kosalram Centenary Year - 19th May 2015. Late Shri K. T. Kosalram (b. 22nd December 1915 – d. 1985) son of late Shri Kalinga Thusimuthu was born at Arumughaneri, Tiruchendur Taluk. He was an agriculturist and small scale industrialist participated in the freedom movement from an early age. A politician and member of Indian National Congress was also a member of Composite Madras State Legislative Assembly during 1946-56, Tamilnadu Legislative Council and Assembly during 1957-52, 1962-67 and a Member of Parliament from Tiruchendur constituency in 1977, 1980 and 1984 elections. He also editor of ‘Pudumai’ and owned Tamil Newspapaper ‘Seithi’. He was instrumental in the construction of Manimuthar Dam (Tirunelveli District). A Special Cover was released in commemoration of centenary celebrations of Shri K. T. Kosalram on 19th May 2015 at Tuticorin by Postmaster General, Southern Region, J. Charukesi and it was received by TNCC President Shri E.V.K.S. Elangovan. Special Cover on Sansad Adarsh Gram Yojna - 18th May 2015. The Sansad Adarsh Gram Yojna, launched on 11th October 2014, is a dream Project of Prime Minister Shri Narendra Modi. Under this project Shri Ravi Shankar Prasad, Minister of Communications and Information Technology, Government of India, has adopted Alawalpur village of Patna district. On 18th May 2015, Hon’ble Minister inaugurated a fully computerized and modern Sub Post Office at Alawalpur village. On this occasion a special cover on Sansad Adarsh Gram Yojna was released by Shri Ravi Shankar Prasad at Alawalpur, Dist. Patna. The special cover bears the post office premises as well as the logo of Sansad Adarsh Gram Yojana as cover illustration and ‘Beti Bachao Beti Padhao’ as Cancellation. Special Cover on RCB "Game for Green" cricket match held at Bengaluru – 17th May 2015. Royal Challengers Bangalore, also called RCB is the franchise of the Indian Premier League (IPL). Royal Challengers, who pride themselves in creating environmental awareness among their fans, initiated Go Green initiative step towards addressing the issue of global warming, reducing its impact on the environment and to reduce our carbon foot-print. RCB have been promoting 'Go Green' efforts for the last few years. 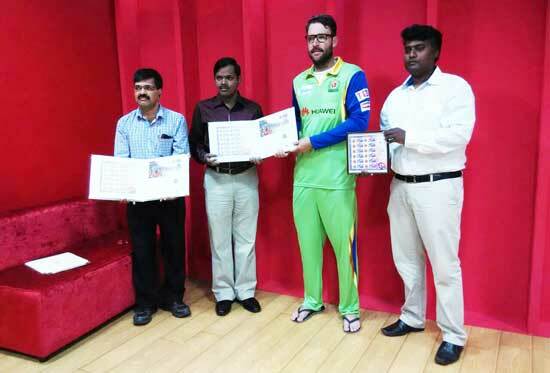 My Stamp and Special Cover were released by Daniel Vettori Coach of RCB with members of the Karnataka Postal Circle Shri B S Chandrashekar, Assistant Director of Postal Services, Shri Shivram, Assistant Postmaster General, and Shri K A Devraj, Senior Superintendent of Post Offices. Special Cover on Centenary of Rasika Ranjana Sabha, Tiruchirappalli – 16th May 2015. Rasika Ranjana Sabha is one of the oldest Sabhas in Tamilnadu, having been established Mr. F.G. Natesa Iyer on 3rd November 1914 accompanied by late Sir. D. Desika Chariyar, Peththachchichettiyar, Kodiyalam Srinivasa Iyengar, Anantharamaiyer and Shanmugasundara Maapillai as executive committee members. Rasika Ranjana Sabha is one of the very few sabhas being given the privilege of conducting the programmes sponsored by Tamilnadu Iyal Isai Nataka Mandram, Chennai. On 12th Jan 1935 the foundation was laid by collector Mr. Cook. In 1974 Rasika Ranjana Sabha was awarded by Tamilnadu Iyal Isai Nataka Mandram - Chennai, for its services in encouraging the young dynamic talented people in Arts. Special Cover on first postal ATM of Bihar Circle at Patna - 16th May 2015. Union Information and Technology Minister Ravishankar Prasad inaugurated the first postal ATM in Bihar at PATNA GPO on 16th May 2015. Hon’ble Minister also inaugurated the Core Banking Solution at 31 Head Post Offices of Bihar Postal Circle. 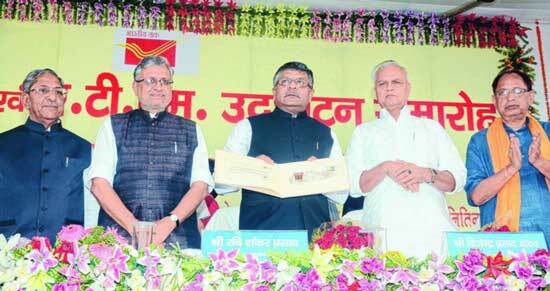 On this occasion Shri Ravishankar Prasad released a Special Cover to commemorate first postal ATM of Bihar Postal Circle. Bihar Finance Minister Bijendra Prasad Yadav and senior state BJP leaders Sushil Kumar Modi and Nand Kishore Yadav were present at the function. The cover bears Patna GPO premises as well as newly installed ATM location as cover illustration and the logo of India Post as Cancellation. 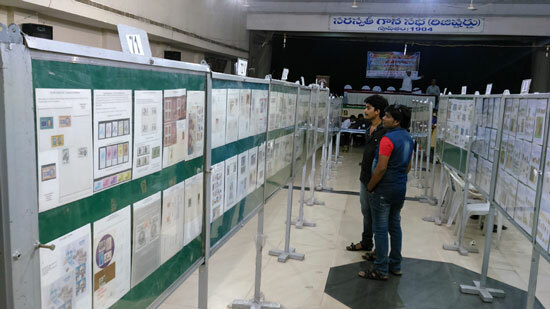 EG NPEX - 2015 Philatelic Exhibition at Kakinada - 15th - 17th May 2015. 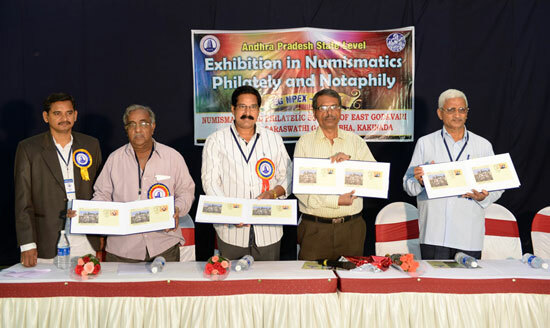 Numismatic & Philatelic Society of East Godavari organized ‘EGNPEX – 2015’ the State Level Philatelic & Numismatic Exhibition on the occasion of decennial anniversary at Surya Kalamandir, Kakinada from 15th to 17th May 2015. The exhibition was inaugurated by Shri B. V. Sudhakar, Chief Postmaster General, Andhra Pradesh Postal Circle on 15th May 2015. Shri M. Sampath, Postmaster General, Vijayawada Postal Region, Smt. Sharda Sampath, Postmaster General, Visakhapatnam Postal Region and Smt. L. Seshakumari, Vice President, Saraswathi Ganasabha and Ex. Member Philatelic Advisory Committee were special guests on the occasion. 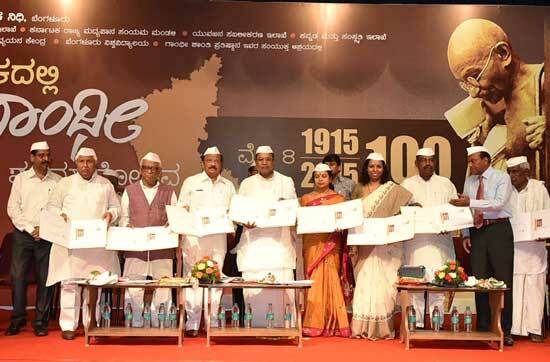 On 15th May 2015, three special covers and a souvenir were released by Shri B. V. Sudhakar, Shri M. Sampath, Smt. Sharda Sampath and other guests on dais. First special cover was released on Smt. Dokka Seethamma (Annapurna) (Special Cover approval no. AP/8/2015). Considered as a saint during her own life, Dokka Seethamma (1841-1909 C.E.) spent years feeding the poor and sick in her village. She was born in 1841 in Mandapeta. She was known by many as “Annapuurnamma”. This was because of her sadgunams like Atithi-seva and Anna-daanam. To whoever was hungry, she used to cook food and serve them. In no time her fame went to all directions. In 1902, December, she was called to Delhi for receiving an award for her daana-gunam. With great Vinayam, thinking that Atithi-seva, Anna-daanam are the minimum things that Bhaarateeya Samskruti imposed in order to show one’s Krutagnyata to his fellow humans, she didnt attend the function to receive the award. After her death, the holy woman was lauded throughout India as "Apara Annapurna"- an incarnation of the goddess Annapurna. The special cancellation depicts Smt. Dokka Seethamma feeding poor people. Second special cover was released on Dowleswaram Anicut on Godavari River by Sir Arthur Thomas Cotton. (Special Cover approval no. (AP/9/2015). The Dowleswaram Barrage is an irrigation structure which is built on the lower stretch of the Godavari River before it empties into the Bay of Bengal. It was built by a British irrigation engineer, Sir Arthur Thomas Cotton. General Sir Arthur Thomas Cotton KCSI (15 May 1803 – 24 July 1899) was a British general and irrigation engineer. Cotton devoted his life to the construction of irrigation and navigation canals throughout British India. His many projects averted famines and stimulated the economy of southern India. The Godavari River empties its water into the Bay of Bengal after flowing nearly fifty miles from the Dowleswaram Barrage. The village of Dowleshwaram is at a distance of eight kilometers downstream of Rajamundry. Third special cover was on Bojjanakonda and Lingalametta Hillocks, Sankaram (Anakapalli). (Special Cover approval no. AP/10/2015). Bojjannakonda and Lingalametta or Lingalakonda are two Buddhist sites which exist on adjacent hillocks near a village called Sankaram. It is located at about 45 km from Vishakhapatnam and just a few kilometers from Anakapalle. The sites are believed to date between 4th and 9th Century A.D, that was when at Sanakaram (Sangharam as it was called then) when the 3 phases of Buddhism (Hinayana, Mahayana, and Vajrayana) flourished. 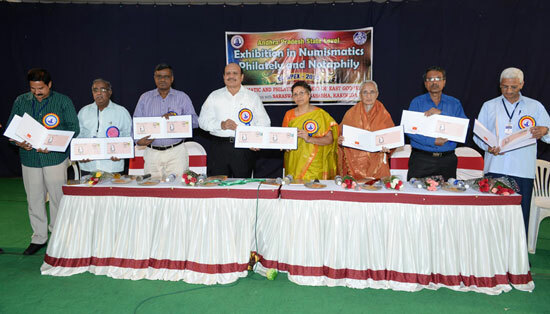 On 16th May 2015, two special covers were released by Shri K. Somasundaram, Director Postal Services, Vijayawada, Dr. D. Vijay Kumar, President, Numismatic & Philatelic Society of East Godavari and other office bearers of society. Nedunuri Krishnamurthy (10 October 1927 – 8 December 2014) was an Indian Carnatic vocalist. He was born in 1927 at Kothapalli, Pithapuram Taluka, Godavari district. His father held a minor job at the estate of the Raja of Pithapuram. He was under influence of his mother who sang Ashtapadis, Tarangas and the Adhyatma Ramayana kritis. She had a great influence on him while growing up. Krishnamurthy joined the Maharaja's Music College at Vizianagaram in the year 1940 and received initial training in Violin and Vocal from the Dwaram Narasinga Rao Naidu. In 1949, he was influenced by carnatic vocalist, Sripada Pinakapani, and under his guidance developed his style of music. 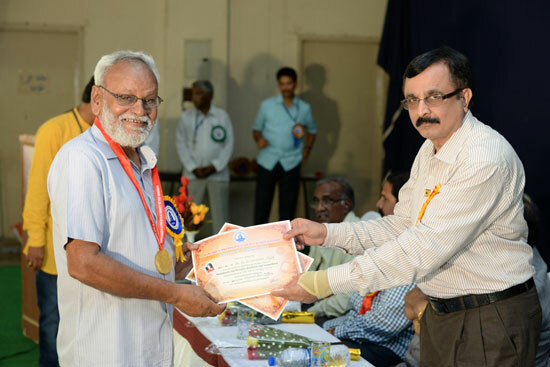 Krishnamurthy worked as Principal of S. V. College of Music and Dance, Tirupati; M.R.Government College of Music and Dance, Vizianagaram; Government College of Music and Dance, Secunderabad; and retired as Principal of G.V.R Government College of Music and Dance, Vijayawada in 1985. He was Dean of Faculty of the Fine Arts and Chairman of Board of Studies in Music of Sri Venkateswara University and Nagarjuna University. Second special cover was on Kolleru Bird Sanctuary (Special Cover approval no. AP/11/2015). Kolleru Bird Sanctuary is arguably one of the best fresh water lake sanctuaries in the Indian sub-continent. It includes a multitude of wildlife species that live inside the sanctuary. This wonderful park area is situated in the Deltaic region, between Godavari and Krishna rivers in Andhra Pradesh State. It is a paradise for many migratory birds from Egypt, Siberia, Australia and Philippines, that flock down in huge numbers during Indian winter season. This haven for birds is just 65 km from the Vijaywada city. Tourists, adventure travelers, nature lovers and environmentalists make it a point to visit this natural home for rare birds. Kolleru Bird Sanctuary was established in November 1999, under the Wildlife Protection Act in India. Tourists from around the world are aware of the popular bird sanctuary and its natural beauty. Birds like red-chested pod chards, storks, pintails, Ibises, teals, etc are found in great numbers at this lovely bird sanctuary. The natural cool breeze from the lakeside and the placid surroundings hold a magical appeal to the migratory birds. There is even a watch tower that helps the visiting tourists to observe the birds closely. This beautiful lake sanctuary is also called as Colair Lake by local people. 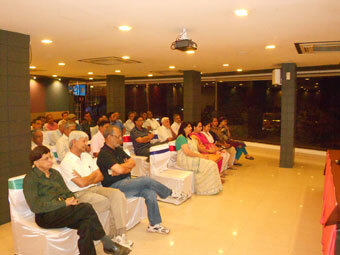 Exhibition was well attended by stamp, coin and currency notes enthusiasts. In competitive class 139 frames were exhibited out of which 116 frames were in senior class and 23 frames were in youth class. 26 frames were exhibited in invitee class. Valedictory function was held on 17th May 2015. 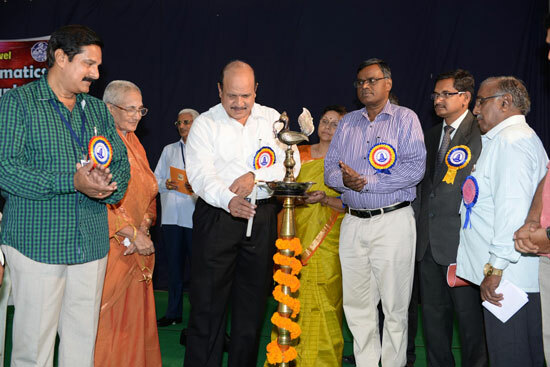 Shri Govinda Swamy, Commission, Municipal Corporation, Kakinada was the chief guest of function. The Jury panel consisted of Dr. D. Vijay Kumar, Chairman, Exhibition Committee, Mr. B. K. Nagpal of Hyderabad and Mr. Prashant H. Pandya of Vadodara. 4 first Prizes, 8 second Prizes, 14 third prizes were awarded in senior class and in junior class 2 second prizes, 2 third prizes and 8 consolation prizes were awarded. Special Cover on Chatrapati Sambhaji Maharaj – 14th May 2015. Sambhaji Bhosale (14 May 1657 – 11 March 1689) was the eldest son of Chhatrapati Shivaji, the founder of the Maratha Empire, and his first wife Saibai. He was successor of the realm after his father's death. Sambhaji's rule was largely shaped by the ongoing wars between the Maratha kingdom and the Mughal Empire, as well as other neighbouring powers such as the Siddis, Mysore and the Portuguese in Goa. Sambhaji was captured, tortured, and executed by the Mughals, and succeeded by his brother Rajaram. 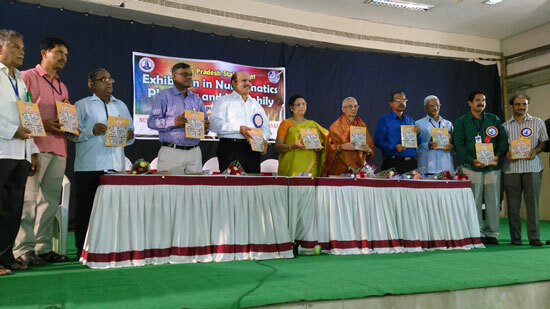 A special cover was released by Shri D. B. Shirke, Sr. 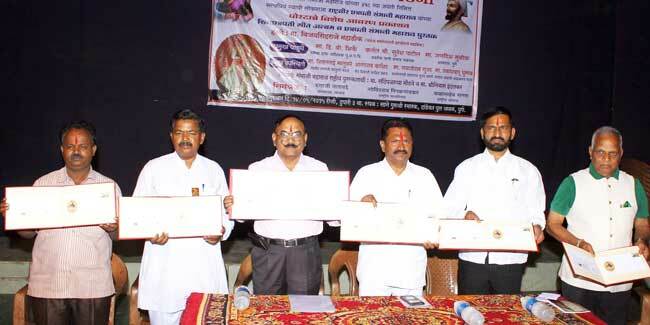 Superintendent of Post Office, Pune City West Division on the occasion of 358th birth anniversary of great Maratha warrior Chatrapati Sambhaji Maharaj at Pune on 14th May 2015 at the function organized by Mavala Javan Sanghatna, Pune (Special cover approval no. MH/19/2015). 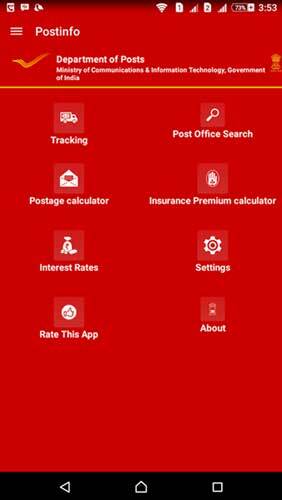 Postinfo- India Post Android Mobile App launched – 11th May 2015. Hon’ble Minister of Communications & Information Technology, Shri Ravi Shankar Prasad launched ‘Postinfo’ Android Mobile App of India Post on 11th May 2015 at e-Commerce Centre, Safdarjung , New Delhi-110003. 1. Tracking of articles: Users can view the status of various articles by entering the articles number and touching the Track button. User can save the screenshot of the results for future reference or to share it with others through email, Google drive, WhatsApp, Facebook etc. 2. Post office search: By entering first 4 character of the name of the Post office or by entering the Pin code users can get a list of matching Post offices. By clicking on the name of Post office user gets more details of Post office viz. contact details, name of the division etc. 3. Postage Calculator: It provided information about domestic postage to be paid for all types of articles based on the weight entered by the user. 4. Insurance premium calculator: Users can check the premium payable for all the types of Postal /Rural Postal Life insurance Policies on the basis of the input entered. 5. Interest calculator: By entering amount, it provides the interest rate for each savings scheme and maturity amount. Special Cover on Golden Jubilee Celebration of Rotary Bangalore North - 9th May 2015. Rotary Bangalore North, the second oldest club in Bangalore City, was sponsored by Rotary Club of Bangalore. The club was officially inducted into the fold of Rotary on 9th May 1966 and the formal presentation of the Charter was made on 23rd June 1966. Rotary Bangalore North, RI District 3190 formed a trust in the name of Bangalore North Rotary Trust and established the same in the year 1995 to manage an Eye hospital where a worthy cause was being pursued to fight against reversible blindness. The Rotary Eye Hospital at Rajajinagar Bangalore is dedicated to the cause of blindness control and cure. The hospital renders free service to the rural & urban poor through regular outreach camps held in the around Bangalore. Special Cover on 300th Anniversary of Arameri Kalancheri Mutt, Virajpet – 9th May 2015. Kodagu King Sri Siri Bai Doddaveera Raja’s (A. D. 1681-1738) sister Nellammaji was married to a youth of Beppu Naadu. She became a widow at young age. She adopted spiritual life and to initiate through a teacher a mutt was built in 1690 at Arameri. The mutt follows the principles of Jagajyothi Basavanna. Sri Shanthamalla Swamiji opened the mutt to common people and also added an education institution in 1946. He made this “Arameri Kalamcheri mutta” as his abode of work. On the occasion of tercentennial celebrations of Arameri Kalancheri Mutt and birth centenary celebrations of late Sri Shantamallaswami a Special Cover was released at Virajpet on 9th May 2015. (Special Cover approval no. KTK/42/2015). On this occasion Sri Lingarajendra Prasad Nilaya was also inaugurated. This hostel can accommodate 300 students. The Special cover depicts the image of the Sri Lingarajendra Prasad Nilaya and photo of Shantamalla swami with the image of the mutt in the backdrop. Special Cover on Centenary year of Mahatma Gandhiji's first visit to Bengaluru - 8th May 2015. Mohandas Karamchand Gandhi set his foot on Bengaluru for the first time on 8th May 1915, he was yet to be called Mahatma, but he wasn't an unknown name in Bengaluru. Gandhi's first visit to the city months after he returned to India from South Africa, is a tale punctuated with a display of simplicity. Following his political guru Gopal Krishna Gokhale's advice, Gandhi was then touring the country to learn about its realities before plunging into politics. During that time, renowned Kannada writer and political activist DV Gundappa's (DVG) request that Gandhi inaugurate the Mysore Social Service League - created based on Gokhale's nationalist principles — brought him to the city, says historian Vemagal Somashekar. 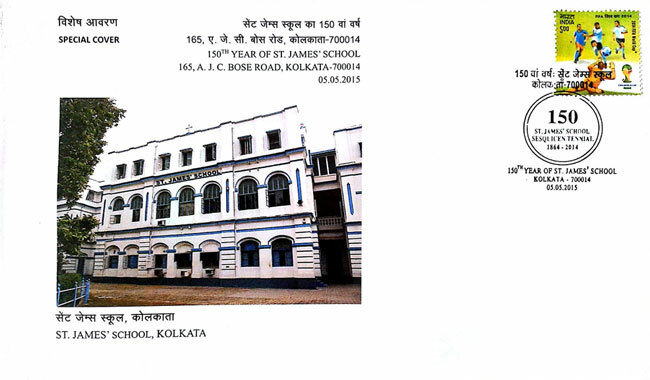 Special Cover on 150th year of St. James’ School, Kolkata – 5th May 2015. St. James' School, Kolkata is a CNI school, one of the oldest and most prestigious private schools in India. It is associated with the ICSE Board of Education. It was established in 1864. It was inaugurated by the then Most Revd. George Edward Cotton- the Bishop of Calcutta on 25th July 1864. The school was closed between 1904 to 1907 and 1918 – 1924 due to financial difficulties. Under the Rectorship of The Rev. Thomas H. Cashmore, the Vicar of St. James' Church it was reopened in 1924. Rev. Cashmore established a renaissance in the life of both church and school. The impact of World War II was felt in the period between 1942 and 1946. Air raid shelters were constructed in the school compound and the school premises requisitioned by the R.A.F. on rent. The boarders were sent off to Christ Church School, Jabalpore, and to Bishop Westcott School, Allahabad. The school itself functioned from two rented premises on Ripon Street and Lower Circular Road. The school moved back to its own premises in July 1947. 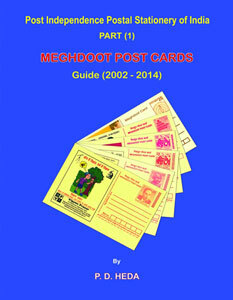 Shri Purushottam Das Heda, philatelist from Hyderabad has released his first publication titled ‘Meghdoot Postcards Guide’ (2002-2014), Post Independence Postal Stationery of India, Part 1, providing complete listing of Meghdoot Postcards issued from 2002 to 2014. The book consists of 130 pages printed on art paper with multi-color illustrations priced at Rs. 650/- (US $30/-), postage extra. This publication would be very much helpful to postal stationery collectors and especially those who are interested in Meghdoot Postcards. Author Shri Purushottam Das Heda can be contacted via email pdheda@hotmail.com or on mobile no. +919848089049. 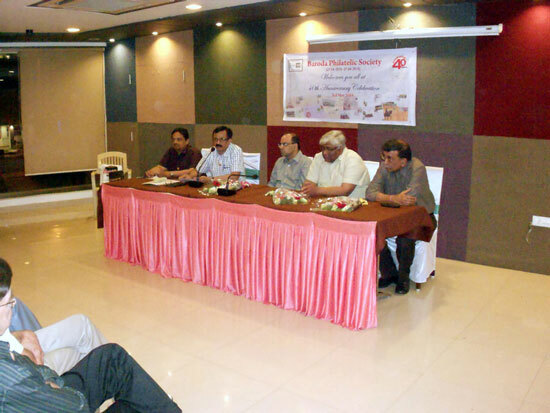 40th Anniversary of Baroda Philatelic Society. 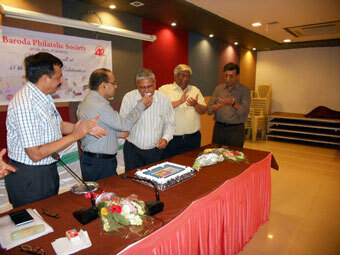 Baroda Philatelic Society was established on 27th April, 1975, with 17 founder members. It is one of the oldest Societies in the state of Gujarat. 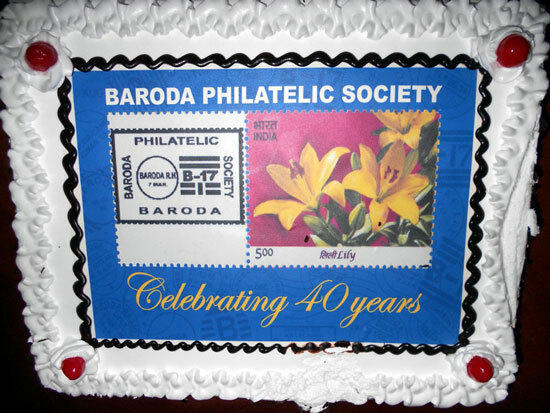 Baroda Philatelic Society completed 40 years of its existence on 27th April 2015. 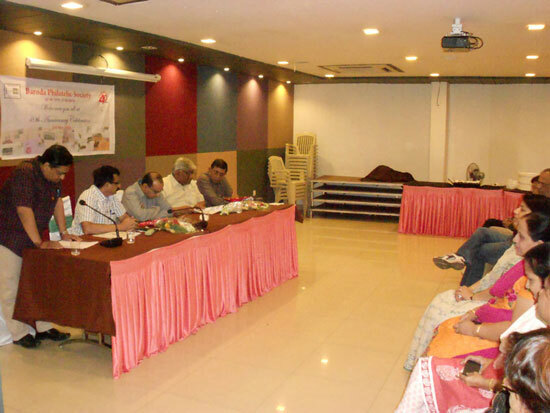 A function was organized to celebrate 40th Anniversary of Society on 3rd May 2015 at Blue Lagoon Restaurant & Banquet, Vadodara. Shri Vineet Mathur, Postmaster General, Vadodara Region and Shri Ganesh Sawaleshwarkar, Director, Postal Training Centre, Vadodara were present on the occasion as the Chief Guest and Guest of honour respectively. Shri Ashok Bayanwala, Senior Philatelist and honorary member of Society was also present on the dais with Shri Prashant Pandya, President and Timir Shah, Secretary of Baroda Philatelic Society. 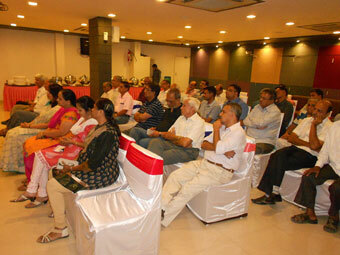 Function was well attended by members of society. 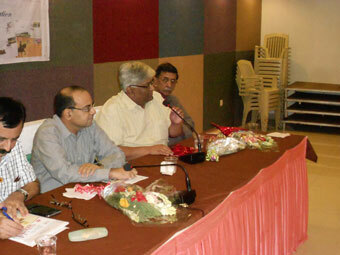 Shri Pandya brief about the society’s history and activities of society during last 40 years. Founder members, past presidents, vice presidents and secretaries of society were remembered on this occasion. 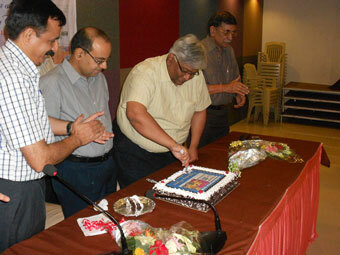 On the occasion a specially made Cake was cut by guests and one of the founder members of society Shri D. T. Desai. 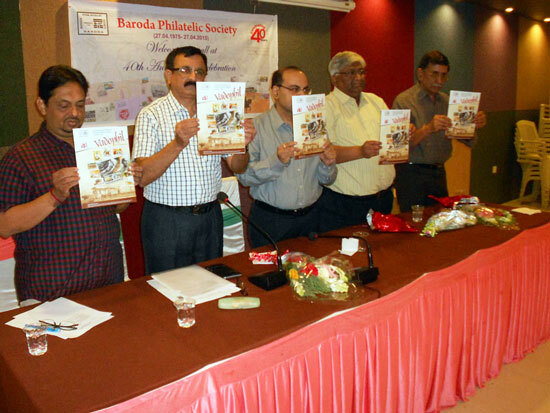 Latest issue of Vadophil, quarterly newsletter of Baroda Philatelic Society with multicolour title pages was also released by the guests on the dais. Shri Ganesh Sawaleshwarkar and Shri Vineet Mathur blessed the occasion and appreciated the activities of the society and congratulated all members for serving philately for the last 40 years. 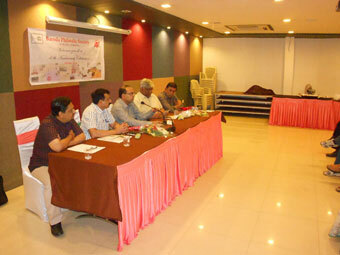 Shri Timir Shah, Secretary, Baroda Philatelic Society, conveyed vote of thanks. Function was followed by dinner.